Once grand reminders of how interconnected the United States had become, train stations across the country slowly fell out of use and into disrepair in the 1960s and ‘70s when new transportation technology outpaced them. Luckily for some train stations, though, dedicated investors decided to revive these historic landmarks in their respective towns and cities. Many of these places were put to new use, and their historic roots have not been forgotten—whether through fascinating docent-led tours, or by their faithfully restored vaulted ceilings and other original architectural details. Three such train stations, all members of Historic Hotels of America, have been turned into vacation getaways. Learn more about these train station-turned-hotels in Nashville, Tennessee; St. Louis, Missouri; and Chattanooga, Tennessee. 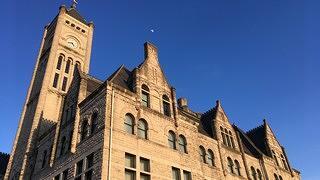 Exterior facade of the Union Station Hotel Nashville, built in 1900. The hotel's mezzanine is adorned with bas-relief sculptures and a clock. 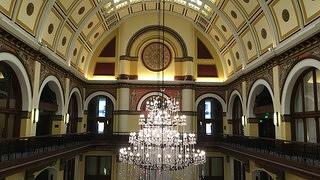 The barrel-vaulted, stained glass ceiling and one of three chandeliers that adorn the lobby. It seems inconceivable today, walking into Nashville, Tennessee’s Union Station Hotel, that the building, with its impressive Richardsonian Romanesque tower and 65-foot barrel-vaulted, stained glass lobby ceiling, was once under threat of being lost. But it’s true—in the late 1970s, Nashville’s train station, built in 1900, became a white elephant. Fortunately, Historic Nashville, Inc. and other local leaders knew that losing the building would be a travesty and set their minds to saving it. After many years of hard work, they shepherded its transformation into a hotel by 1986. The most impressive artwork in the hotel may be its bas-reliefs, or sculptures that have less depth so they can be viewed from many angles without being distorted. 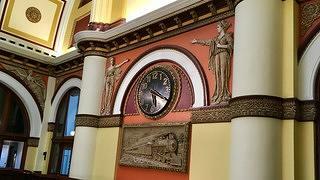 The two bas-reliefs surrounding its mezzanine-level clock are “Miss Louisville” and “Miss Nashville,” modeled after two of the station builder’s five daughters. More panels illustrate the evolution of transportation from a chariot to a locomotive. In addition to the hotel’s restored architectural features, such as its marble floors, oak-accented doors and wells, and three limestone fireplaces, the Union Station Hotel has some quirky history to share. 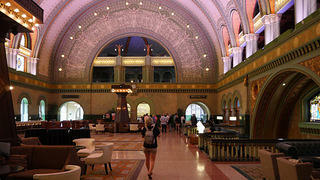 The lobby of the train station, for example, once included two pools, both home to alligators. Union Station’s tower featured the first digital clock in the United States, though it never worked particularly well. And one of the station’s most famous “guests” was Al Capone, whose train traveled through the city on his way to federal prison (but he never actually departed the train). Read more about the Union Station Hotel's most recent 2016 renovation. 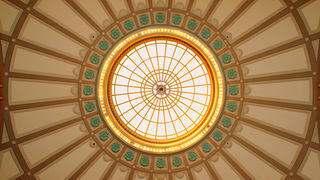 St. Louis Union Station Hotel's 65-foot barrel vaulted ceiling features a high-def light show each day. The exterior facade of this 547-room hotel in St. Louis. The "Allegorical Window" depicts three women who represent New York, St. Louis, and San Francisco, from left to right. 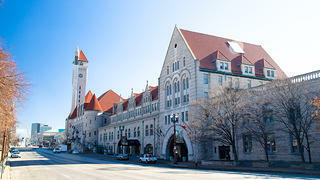 This 537-room hotel in St. Louis, Missouri, was originally built as the Union Station travel center in 1894. The addition of a train station in the city center opened it up as a gateway not only to the West, but to the entire United States. Union Station became one of the largest and busiest passenger rail terminals in the world. Especially during significant moments in history, like the St. Louis World’s Fair and World War II, the station was often filled to its capacity of over 100,000 people per day. Famous faces like President Harry Truman, Joe DiMaggio, and Joan Crawford were spotted at the station. After the final train departed the St. Louis Union Station on October 31, 1978, the building lay dormant until 1985, when it was reopened as a mixed-use complex featuring retail shops, event spaces, restaurants, and a now-iconic Historic Hotel of America. Today, the former train station still features its classic architectural details, such as its 65-foot barrel vaulted ceiling, terrazzo floor, green glazed terracotta bricks, and stained-glass windows. 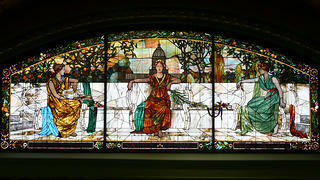 The hotel’s “Allegorical Window” depicts three women who represent 1890s-era travel from New York to St. Louis to San Francisco in Tiffany glass. Other aspects of the hotel integrate modern amenities and art into the otherwise historic building. Each day at 5 p.m., an innovative high-def laser show projects across the Grand Hall’s ceiling. These restaurants (all of which were once train stations) serve up hot dishes that would make any Amtrak traveler jealous. The station’s original 75 hotel rooms—simple spaces once meant for the railroad personnel and travelers who were passing through town—have been fully renovated. The rooms give a nod to Union Station’s history with railroad-themed artwork and decor. St. Louis Union Station Hotel has big plans for the future, including the restoration of its steel train shed; a new Ferris wheel next door to the property; reimagined outdoor spaces that give new life to historic train cars and steel shipping containers as restaurants and shops; a pedestrian-friendly plaza, perfect for festivals, outdoor concerts, and other events; and the soon-to-be St. Louis Aquarium, set to open in 2018. The aquarium’s crowning glory is its massive shark tank, which will hold one of the largest collections of sharks in the Midwest. 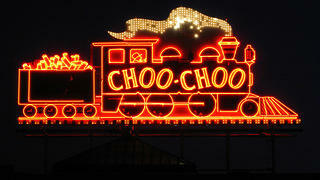 This neon sign lights the way for travelers looking for the Chattanooga Choo Choo hotel. The large, freestanding dome in the middle of the hotel is its crowning glory. The Chattanooga Choo Choo maintains its historic exterior. Designed by a 24-year-old architectural student from New York, The Chattanooga Choo Choo hotel (originally Terminal Station) in Tennessee was a major hub for trains pointing south between 1909 and 1970. The station originally saw more than 50 passenger trains per day and welcomed such famous guests as Presidents Woodrow Wilson, Theodore Roosevelt, and Franklin Roosevelt. The focal point of this 24-acre historic property, meant to emulate the National Park Bank of New York, is its 85-foot free-standing dome. The station closed to the public by 1970. The building was in danger of demolition until a group of local businessmen reopened it as a unique vacation complex, and the Chattanooga Choo Choo became one of the city’s first historic preservation projects. 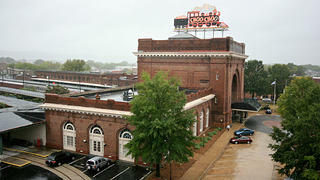 A group of Chattanooga investors called the Choo Choo partners renovated the complex in 1989 and again in 2014 to include new restaurants, music venues, and an on-site apartment conversion. Now, guests can choose between traditional rooms in the MacArthur Building and the unique Pullman Train Car guest rooms, which are reminiscent of luxury travel accommodations from yesteryear. The hotel also donated their free-standing dome to local preservation organization Conerstones, Inc., so that future generations can always enjoy it without fear of demolition. One of the most interesting features of the hotel is the Chattanooga Choo Choo Train, on display at Terminal Station. The train is the same kind of wood-burner used for the first journey to Chattanooga from Cincinnati. It was also the first “choo choo” to provide nonstop service. Completely refurbished, the Chattanooga Choo Choo Train is now the only engine of its kind in the city.